Flow cytometric analysis of HeLa cells, untreated (green) or treated with Trichostatin A (TSA) #9950 (400 nM, 20 hr; blue) using Acetyl-Histone H4 (Lys16) (E2B8W) Rabbit mAb (PE Conjugate). 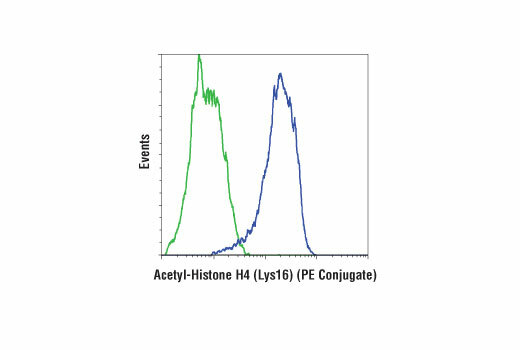 Acetyl-Histone H4 (Lys16) (E2B8W) Rabbit mAb (PE Conjugate) recognizes endogenous levels of histone H4 protein only when acetylated at Lys16. This antibody does not cross-react with other acetylated histone proteins. Monoclonal antibody is produced by immunizing animals with a synthetic peptide corresponding to residues surrounding acetylated Lys16 of human histone H4 protein. This Cell Signaling Technology antibody is conjugated to phycoerythrin (PE) and tested in-house for direct flow cytometry analysis in human cells. This antibody is expected to exhibit the same species cross-reactivity as the unconjugated Acetyl-Histone H4 (Lys16) (E2B8W) Rabbit mAb #13534. The nucleosome, made up of four core histone proteins (H2A, H2B, H3, and H4), is the primary building block of chromatin. Originally thought to function as a static scaffold for DNA packaging, histones have now been shown to be dynamic proteins, undergoing multiple types of post-translational modifications, including acetylation, phosphorylation, methylation, and ubiquitination (1,2). Histone acetylation occurs mainly on the amino-terminal tail domains of histones H2A (Lys5), H2B (Lys5, 12, 15, and 20), H3 (Lys9, 14, 18, 23, 27, 36 and 56), and H4 (Lys5, 8, 12, and 16) and is important for the regulation of histone deposition, transcriptional activation, DNA replication, recombination, and DNA repair (1-3). Hyper-acetylation of the histone tails neutralizes the positive charge of these domains and is believed to weaken histone-DNA and nucleosome-nucleosome interactions, thereby destabilizing chromatin structure and increasing the accessibility of DNA to various DNA-binding proteins (4,5). In addition, acetylation of specific lysine residues creates docking sites for a protein module called the bromodomain, which binds to acetylated lysine residues (6). Many transcription and chromatin regulatory proteins contain bromodomains and may be recruited to gene promoters, in part, through binding of acetylated histone tails. Histone acetylation is mediated by histone acetyltransferases (HATs), such as CBP/p300, GCN5L2, PCAF, and Tip60, which are recruited to genes by DNA-bound protein factors to facilitate transcriptional activation (3). Deacetylation, which is mediated by histone deacetylases (HDAC and sirtuin proteins), reverses the effects of acetylation and generally facilitates transcriptional repression (7,8). Roth, S.Y. et al. (2001) Annu Rev Biochem 70, 81-120. Yang, X.J. (2004) Bioessays 26, 1076-87. Haberland, M. et al. (2009) Nat Rev Genet 10, 32-42. Haigis, M.C. and Sinclair, D.A. (2010) Annu Rev Pathol 5, 253-95.